This year for Christmas, I decided to make some assortment of baked goods for my team at work. I went with the banana bread I’ve written about before and I decided to try something new. This month’s Bon Appetit had a recipe for chewy ginger cookies. The picture was irresistible. Also, I was intrigued by the variety of ginger inside. 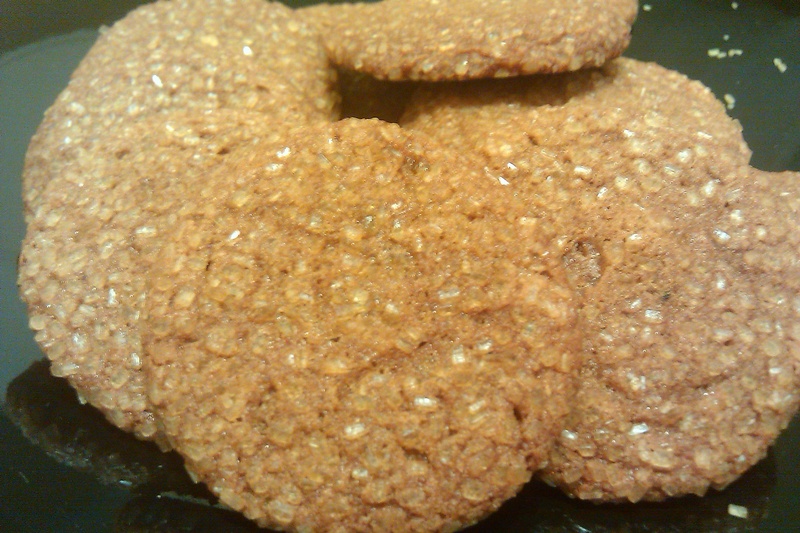 There is ground, fresh, and crystallized, giving it serious ginger appeal. So I baked these over the weekend and I’m very pleased with the outcome. Company this weekend enjoyed them, I enjoyed them, and I’m pretty confident that my colleagues are likely at home chewing down on them right now. I know I am. Before I baked these, I tasted the batter. Honestly, I wasn’t excited. They weren’t very sweet and I worried they would be too strong. 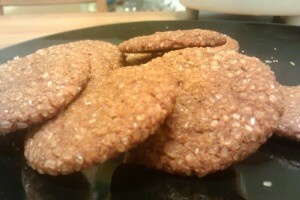 But, once I rolled them in the raw sugar and baked them, I was blown away. 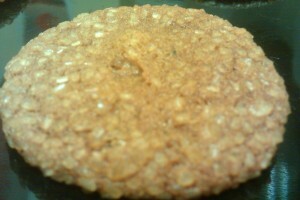 The chewiness of the cookie is in nice contrast to the crunchiness of the sugar. And the best part of the sugar crust? It makes the cookies sparkle. They are just awfully darn festive. Place raw sugar in a shallow bowl. Using a tablespoon measure, scoop out dough. Using a second spoon, scoop dough from tablespoon measure into bowl with raw sugar; turn to coat well. Roll into ball. Transfer to prepared baking sheet. Repeat with half of remaining dough and sugar, spacing balls 1 1/2″ apart. This is probably the last post of the year. So Happy Holidays everyone! I truly wanted to write down a small message to say thanks to you for those fantastic steps you are giving at this website. My considerable internet lookup has now been paid with sensible facts and strategies to exchange with my pals. I would repeat that many of us visitors are undeniably blessed to dwell in a fantastic site with very many lovely professionals with beneficial guidelines. I feel very privileged to have used the webpages and look forward to so many more pleasurable moments reading here. Thanks again for a lot of things. Somebody essentially help to make critically articles I might state. This is the first time I frequented your website page and thus far? I surprised with the research you made to create this particular put up amazing. Great job! Thanks for another informative site. Where else could I am getting that kind of info written in such an ideal approach? I have a project that I’m simply now running on, and I’ve been on the glance out for such info. It¡¦s actually a nice and helpful piece of information. I¡¦m glad that you simply shared this useful info with us. Please keep us up to date like this. Thanks for sharing. Wow, incredible blog structure! How lengthy have you ever been blogging for? you made running a blog look easy. The total look of your web site is wonderful, let alone the content! You really make it appear so easy together with your presentation however I in finding this matter to be actually one thing which I believe I would never understand. It kind of feels too complicated and extremely wide for me. I am looking forward in your subsequent publish, I will attempt to get the hang of it! Hiya, I’m really glad I have found this information. Today bloggers publish just about gossips and net and this is actually annoying. A good blog with interesting content, this is what I need. Thank you for keeping this web-site, I’ll be visiting it. Do you do newsletters? Cant find it. fantastic points altogether, you just received a new reader. What could you recommend about your post that you simply made some days in the past? Any positive?